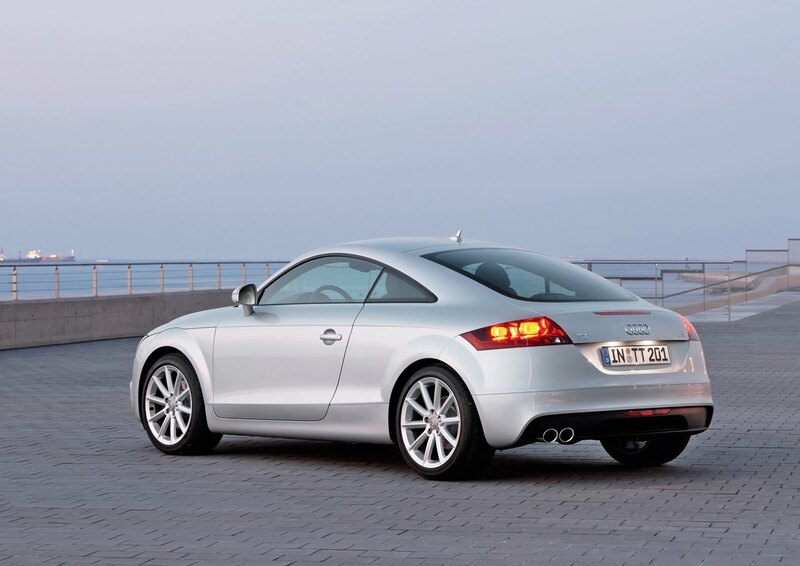 Last month, we were made aware that the newly designed Audi TT would make an official world debut at the 2010 AMI Leipzig Motor Show on April 10th. Today, Audi has released full details of the updated TT range including an exterior/interior facelift plus the addition of a fuel-conscious, 211 horsepower 2.0 TFSI 4-cylinder to the range. Full details and more photos after the jump. Dynamic design, enthralling performance and exemplary efficiency – the Audi TT Coupe and the TT Roadster are now more attractive than ever. The design of the lightweight bodies made primarily of aluminum and the interior have been revised with great attention to detail, while new technologies lower the fuel consumption of the compact sports car. New to the lineup is a powerful and highly efficient four cylinder: The 2.0 TFSI develops 155 kW (211 hp), but is content with an average fuel consumption of just 6.6 liters per 100 kilometers (35.64 US mpg). The second generation TT Coupe and the TT Roadster have made a name for themselves as design icons, similar to their predecessors. Awards such as the 2007 “World Design Car of the Year” document this status. A brawny, broad foundation, powerful shoulders and a flat roofline – the two compact sports cars have fascinatingly masculine lines. Their dynamic appearance is now even more expressive than ever. The most obvious feature at the front of the car is the powerful bumper, which frames the larger air inlets with three-dimensional, sharply drawn out edges. The fog lights are set in chrome rings. Also sporting a new look are the lattice of the single-frame grille in high-gloss black and the optional xenon plus headlights. Twelve white LEDs arranged in a straight line at the lower edge of the headlights serve as the daytime running lights. These together with the wings in the headlight body are classic Audi design features. The tubular, apparently floating reflectors of the tail lights add visual depth to the rear end of the car. The large tailpipes of the exhaust system – the 2.0 TFSI features a dual exhaust – and the larger, flat black diffuser set additional accents. A spoiler that extends at 120 km/h (74.56 mph) improves downforce. The upgrades to the TT Coupe and the TT Roadster have added two centimeters (0.79 in) to both cars, which now measure 4,187 millimeters (13.74 ft) in length. The width of 1,842 millimeters (6.04 ft) and the height of 1,352 millimeters (4.44 ft) and 1,357 millimeters (4.45 ft) for the Coupe and Roadster, respectively, remain unchanged. The wheelbase measures 2,468 millimeters (8.10 ft). Four new metallic colors have been added to the TT color range: Scuba Blue, Oolong Gray, Volcano Red and Dakota Gray. Daytona Gray, pearl effect is also available with the S line package. A key factor for the groundbreaking efficiency and excellent driving dynamics of the TT is the body, which features hybrid Audi Space Frame technology (ASF). Lightweight aluminum is used at the front of the car back to the B-pillar, with steel panels used at the rear. This mix enabled the development engineers to balance the axial loads perfectly and keep the total weight extremely low – prime parameters for dynamic performance. 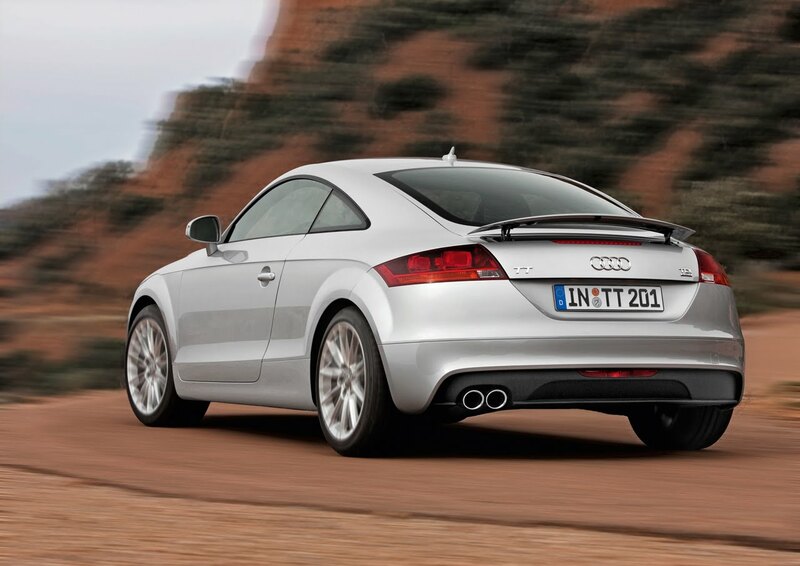 The TT 1.8 TFSI weighs a mere 1,240 kg (2,733.73 lb), a good 100 kilograms (220.46 lbs) less than its closest competitor. The body of the Coupés weighs only 206 kilograms (454.15 lb), which breaks down to 140 kilograms (308.65 lb) of aluminum (68 percent) and 66 kilograms (145.51 lb) of steel (32 percent). The specific reinforcements in the TT Roadster – steel bulkhead, strongly ribbed sills, A-pillar and windshield frame – result in a 58 to 42 percent split of the two materials. The ASF bodies of the TT are not only extremely lightweight, they are also very strong and low-vibration, providing the foundation for sporty and precise handling, the quiet ride and the high passive safety. A package of finely tuned retention systems protects the passengers in the event of a crash. 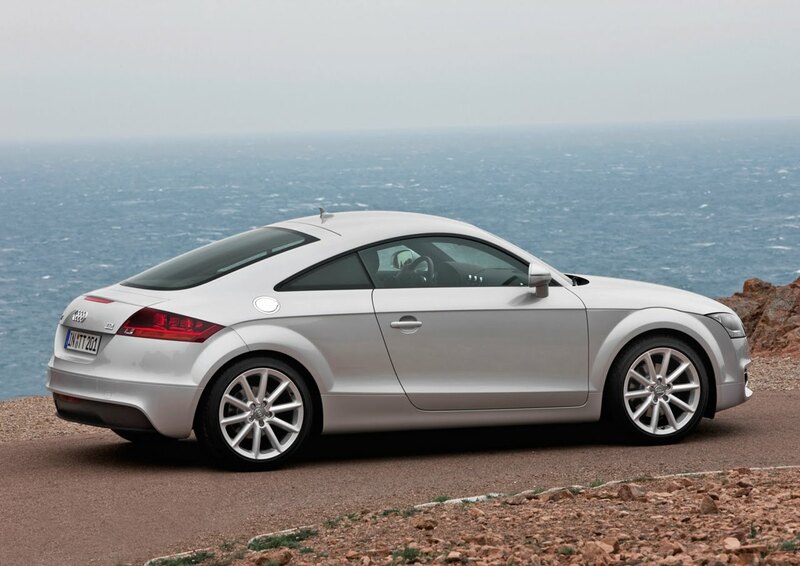 The classic cloth top of the TT Roadster is a perfect complement to Audi’s lightweight construction principle. It contributes to a low center of gravity, fits ideally into the design line and takes up little space when folded. Audi offers the soft top in two variants. The manual version features a central latch for opening and closing the top. An electrohydraulic drive opens the optional fully-automatic top in just 12 seconds, even while driving at speeds up to 50 km/h (31.07 mph). An additional acoustic mat further improves the already excellent acoustics and thermal insulation. 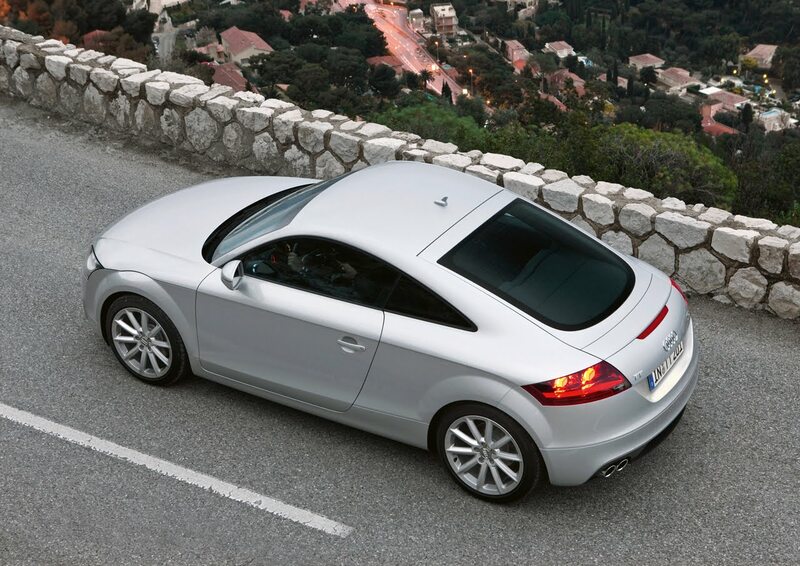 The interior of the TT features a sporty design, dynamic elegance and generous amounts of space. The standard sport seats are mounted low and offer a high level of lateral support. The steering wheel is flattened at the bottom. 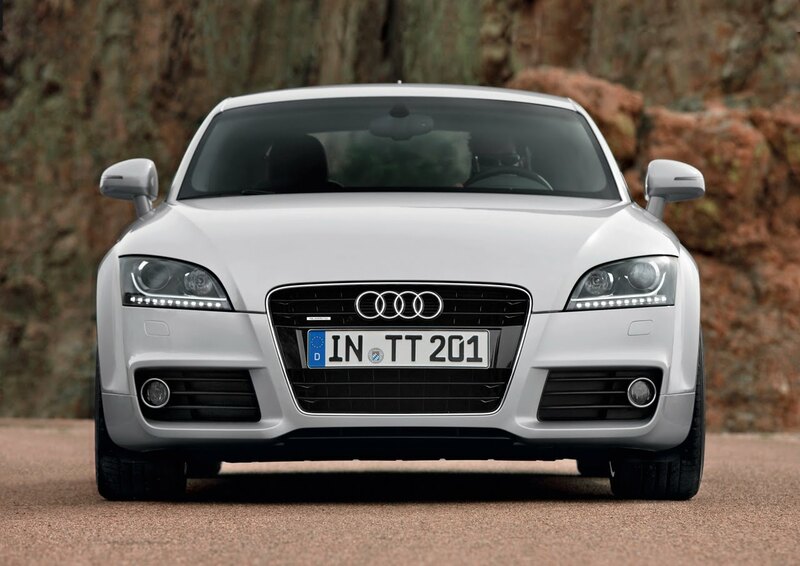 The five round air vents and the arched cowl over the round-dial instruments exude the spirit characteristic of the TT. The ergonomics are logical and the fit and finish is uncompromisingly precise – just like always with Audi. When the ignition is turned, the dials of the speedometer and tachometer briefly run up to the limit before returning to zero. The designers have added additional gloss to the fine interior. New aluminum-look applications shine on the steering wheel, the center console and in the door liner. Elegant accents are provided by rings, frames and strips in high-gloss black. The aluminum strip above the glove box door is now brushed gray. There are three new interior colors from which to choose – nougat brown, titanium gray and garnet red. 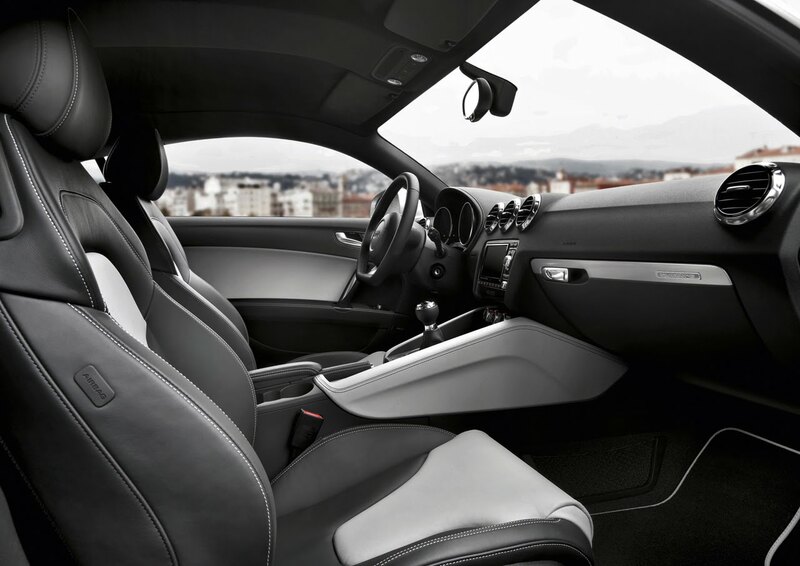 The leather seat covers are specially treated to reduce thermal heating by as much as 20 degrees Celsius (68° F) when the TT is parked in the sun. The TT Coupe and the TT Roadster are sports cars with a high degree of everyday utility. The backs of both rear seats fold down in the 2+2-seater Coupé, expanding the trunk space beneath the long lid from 292 to 700 liters (10.31 – 24.72 cubic ft). The Roadster, which offers 250 liters (8.83 cubic ft) of storage space whether the top is up or down, can also be supplied with the option of a load-through facility. Three four-cylinder engines with turbocharging and direct fuel injection are available for both the TT Coupe and the TT Roadster. The two TFSI gasoline engines and the TDI combine sporty performance with groundbreaking efficiency – their fuel consumption figures have been reduced by up to 14 percent. All three engines are coupled with a recuperation system that recovers energy during braking and coasting phases. New to the lineup is the 2.0 TFSI with 155 kW (211 hp), which replaces the 2.0 TFSI with 147 kW (200 hp) and the 3.2. With a manual transmission, the two-liter engine accelerates the Coupe from zero to 100 km/h (62.14 mph) in 6.1 seconds on its way to a top speed of 245 km/h (152.24 mph). Audi also offers the 2.0 TFSI with an optional drivetrain featuring the six-speed S tronic and quattro permanent all-wheel drive. The spring from zero to 100 km/h (62.14 mph) takes only 5.6 s in this configuration. The Audi valvelift system AVS in the new 2.0 TFSI increases power, torque and efficiency. Equipped with a manual transmission, the TT 2.0 TFSI consumes only 6.6 liters of fuel per 100 km (35.64 US mpg) in the European test cycle. CO2 emissions are an exemplary 154 grams/km (247.84 g/mile). The best value posted by a competitor is 199 g/km (320.26 g/mile). Fuel consumption has improved by 1.1 liters/100 km over the previous model. The 2.0 TFSI is a winner par excellence, having been named “Engine of the Year” five years in a row by an international jury. Its technology package combines high output with impressive pulling power. A constant 350 Nm (258.15 lb-ft) of torque are available between 1,600 and 4,200 rpm. The long-stroke engine, which is extremely cultivated thanks to two balance shafts, has been painstakingly optimized for minimal friction. The Audi valvelift system adjusts the lift of the exhaust valves in two stages depending on need. This reduces flushing losses in the combustion chamber and also ensures that the optimal flow of the exhaust gas is directed to the turbocharger, which in turn ensures that torque is developed quickly. The combination of turbocharging and direct fuel injection also reduces the combustion chamber temperatures and the resulting tendency to knock. This allows a high compression ratio of 9.6:1, which improves efficiency. 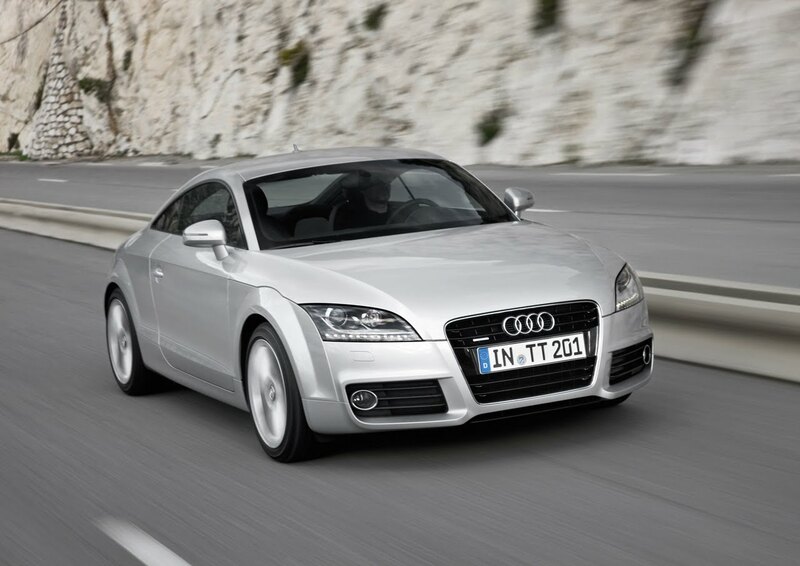 The TT engine lineup includes two other four-cylinder engines besides the new 2.0 TFSI. The 1.8 TFSI, available with a six-speed manual transmission and front-wheel drive, delivers 118 kW (160 hp) and 250 Nm of torque (184.39 lb-ft), the latter between 1,500 and 4,500 rpm. It launches the Coupe from a standing start to 100 km/h in 7.2 seconds, with a top speed of 226 km/h (140.43 mph). It consumes just 6.4 liters of fuel per 100 km (36.75 US mpg) on average, which corresponds to only 149 grams of CO2/km (239.79 g/mile). 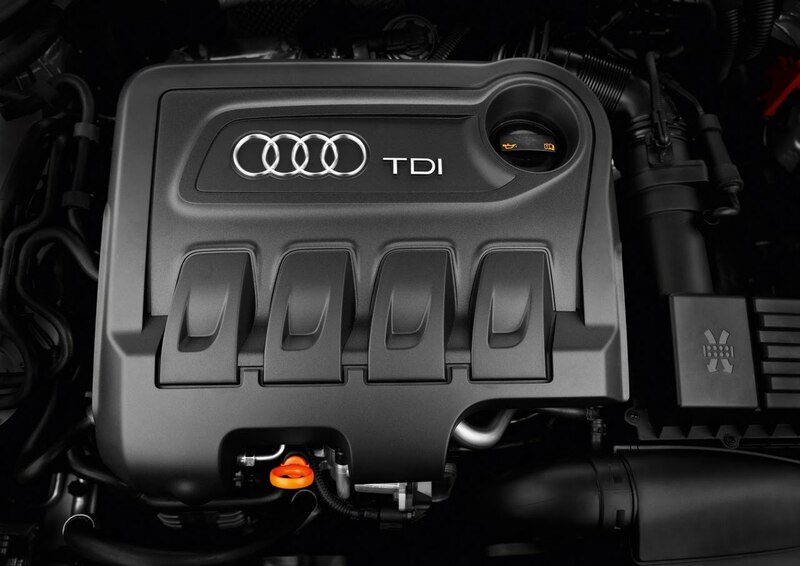 The TT 2.0 TDI remains the only sports car with a diesel engine in its segment, and its efficiency clearly sets the standard. The TT Coupe consumes just 5.3 liters of fuel per 100 km (44.38 US mpg), which corresponds to only 139 grams of CO2/km (223.70 g/mile). With 125 kW (170 hp) and 350 Nm (258.15 lb-ft) of torque – the latter available between 1,750 and 2,500 rpm – the standard sprint takes 7.5 seconds and acceleration continues until a top speed of 226 km/h (140.43 mph) is reached. The two-liter TDI is mated to a manual transmission and quattro all-wheel drive. A precisely shifting six-speed manual transmission transfers power to the wheels regardless of the engine. Audi also offers the S tronic dual clutch transmission as an option for the new 2.0 TFSI. This transmission switches between its six gears with virtually no interruption to the supply of power. The high-tech gearbox shifts extremely quickly and comfortably, either fully automatically or manually as the driver desires. Manual shifts can be made using the optional paddles on the steering wheel. The quattro permanent all-wheel drive system is available as an option for the 2.0 TFSI with the S tronic; it comes standard with the 2.0 TDI. The hydraulic multi-plate clutch, which is mounted on the rear axle in the interest of weight distribution, is electronically controlled. During normal driving, it sends most of the engine’s power to the front wheels, but can quickly transfer up to 100 percent to the rear wheels, if necessary. 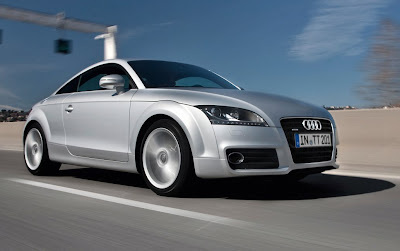 The quattro drive provides substantially greater stability, traction and driving enjoyment, and is another unique selling point of the Audi TT in its class. The front suspension features McPherson struts, with aluminum components used to keep the weight of the unsprung masses low. The power steering is direct, sensitive and thanks to its electromechanical drive, highly efficient. The trailing arms of the four-link rear suspension are relatively soft in the interest of comfort. The connections to the three transverse links per wheel, on the other hand, are rigid in order to direct lateral forces into the body with precision. Available as an option with all variants of the TT is the electronically controlled Audi magnetic ride shock absorber system, another high-tech feature that underscores the unique character of the compact sports car. A fluid containing tiny magnetic particles circulates through the dampers. When a voltage is applied to the magnetic field, the behavior of the particles changes and thus the damping behavior of the fluid changes. A computer fed with input from a bundle of sensors controls the adaptive damping. The driver can choose between two base characteristics, which are now even more clearly differentiated. 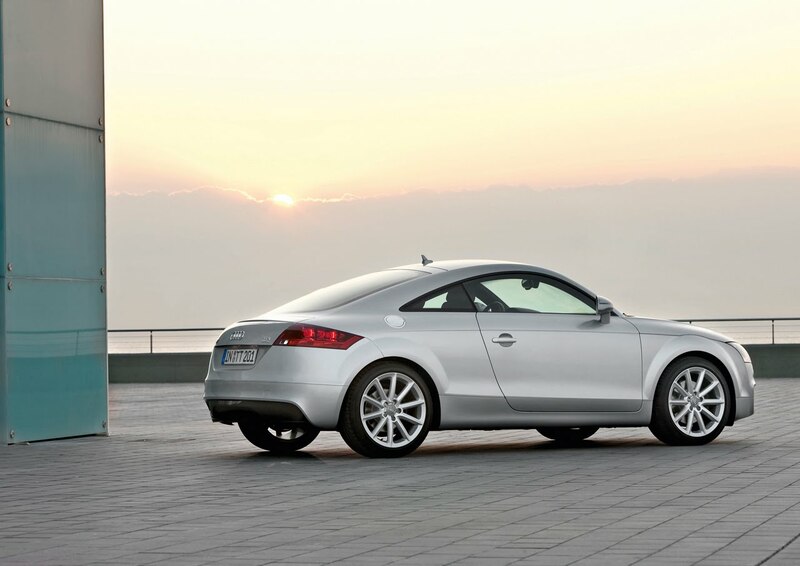 In “Normal” mode, the movements of the TT Coupe and the TT Roadster are balanced – equally agile and comfortable. In “Sport” mode, high damping forces largely suppress body roll. The TT is tautly connected to the road, and its setup is highly dynamic. Another option is available in addition to Audi magnetic ride – the Sport button. The driver can use it to adjust the characteristic of the gas pedal (with manual transmissions), the amount of servo boost for the steering and the engine sound in two stages. The range of wheels has also been reworked, and now features 14 variants. The TT 1.8 TFSI, the 2.0 TDI and the 2.0 TFSI roll off the assembly line on 17-inch aluminum wheels with size 245/55 tires. Winter wheels are available in three sizes; the range of summer wheels extends all the way up to 9 J x 19 with size 255/35 tires. Mounted behind the large wheels are powerful brakes with large-diameter discs. The front discs are internally ventilated. All versions of the TT Coupe and TT Roadster come with a rich array of standard equipment. Among the highlights are the “chorus” audio system, a driver information system and – in the TT Coupe– an automatic climate control system. Two navigation systems, a universal cellular phone preparation and the sonorous Bose Surround Sound system are available as options. The optional xenon plus headlights can be combined with a cornering light function. The onboard computer with efficiency program comes standard in the TT. It displays all of the consumption-relevant data on the central display, and gives the driver tips for efficient driving. The gear-change indicator indicates the proper gear. Another function provides information on which vehicle systems, such as the climate control system, are consuming energy and how that effects fuel consumption. Customizing fans will find a rich selection available in Color & Trim. It begins with the optional leather upholstery and includes four leather packages, an application package and two S line packages. The S line exterior package focuses on design modifications in the area of the bumpers, the air inlets and the diffuser. The S line sport package features a black interior with many fine details in such places as the steering wheel, the seat covers and the applications. 18-inch wheels and body lowered by 10 millimeters (0.39 in) make the handling even more dynamic. 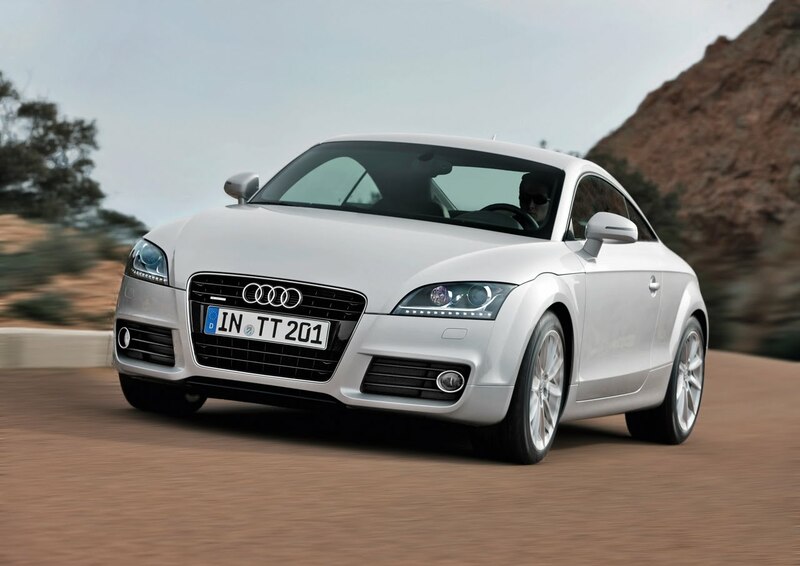 The updated TT Coupe and the TT Roadster will debut on the German market this summer with only minimal changes in price. The 1.8 TFSI will be available from €30,200.